Okay, if these zombies are going to lean so heavily on the reused bodyparts and not give us any specific info about the specific figure we've got, then maybe just hitting the high points in a quick blog review will be enough. Since this figure is part of Series 3, and her art card has Chapter 3 of the story on the back, we can probably assume she's one of the former residents of Tower 101 - someone who was living there, died there, and was then unliving there. She's dressed in very casual civilian clothes - a pink top or sports bra, and a pair of denim shorts. She doesn't even have shoes or socks, which is what most strongly suggests that she was inside, in her apartment. Do you wear shoes inside your own house? Then you're probably a character on a television show, and not a real human being. Look around you: if three of the walls in the room you're in are normal, but the fourth appears to be a bunch of people standing or sitting behind cameras, then that's the clear giveaway. The rest of us take our shoes off when we get home. 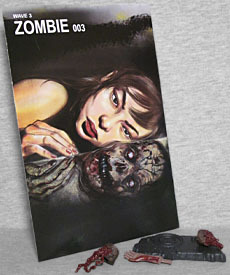 This zombie's head is the same Specimen 425 had, with the torn-up face, though this time her hair is black instead of a brown that's almost identical to the rest of her body. And on that note, her skintone is the same as 425's, as well, meaning it's much lighter than the other zombies have had. And she actually gets paint apps on her eyes for a change! Unfortunately, while the lighter paint on the body makes it easier to see the sculpted wounds, it renders ⅔ of her accessories pretty much useless. You know those "severed spine" and "entrails out for Harambi" parts that all the zombies have had? All the zombies? She has those, but they're still done in the darker color, meaning they look blatantly out of place if you try to give them to her. The disarticulated arm works fine, because that was always just a snack, but that's not enough. Oh, and the base is the same one every figure has, so it works fine. The included art card, which depicts a human woman and her zombie reflection, feels like it's referencing something. An album cover, maybe? If it strikes any chords within your memory, let us know down in the comments. Jus because we're breezing through this review, it doesn't mean Zombie 003 is bad. There's nothing wrong with being mediocre in your line, when the basal level of quality is so high to begin with. This entry was posted in blog exclusive review and tagged Vitruvian HACKS, zombies. Bookmark the permalink.